I like to keep things simple, and usually only bring 2 lenses with me, and throw my speedlight in, just in case. I used to bring 4 lenses and carry a separate bag of tricks for the kiddos. Last fall I decided to simplify and invested in 2 great lenses and a couple of go-to items for the kids: stickers and bubbles. I use the stickers as incentives or place markers. If I have a wooden crate or something with me for a child to sit on, I have the child pick a sticker and put it on the crate to mark his spot. They love the idea of sitting on the dinosaur. For my own emergency kit, I have a spare key and $5 for parking or whatever. I may have lost my keys (or even my phone) during a session before, or forgot to carry cash for parking. I think carrying two bags may have been a part of my challenge of keeping track of everything while chasing kiddos around a park. 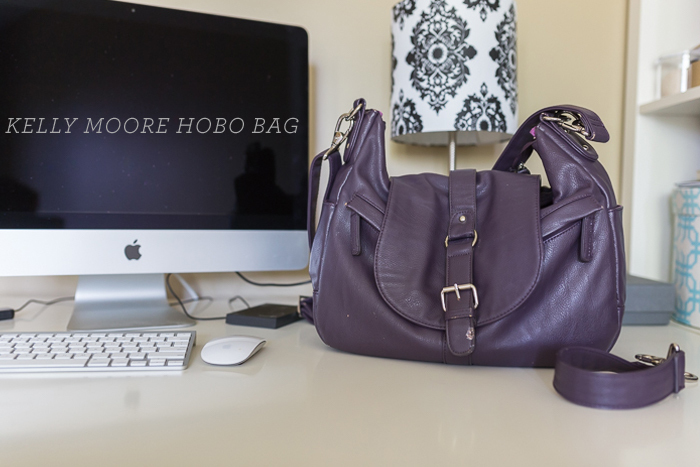 It was so freeing this past fall to walk up with one bag. I used to shoot exclusively with prime lenses, but I got tired of running around like a crazy person, chopping limbs, and missing shots because I was too close or too far away. So, I invested in the 24-70L version ii, and haven’t looked back. Most of my clients have little ones under the age of five. And they are on. the. MOVE. I prefer to embrace rather than fight their energy, so a zoom lens became a must. I can be close if the little ones need more interaction from me or back up if they like their space. I find the 24-70ii gets the job done. I start every session with that lens on my camera. If I can, I will put my 135 2.0 on for individual portraits or sibling shots. I am in love with the compression, how fast it is to focus, and the sharpness. It is dreamy. My expodisc 2.0. I used to shoot kelvin, but still had to do some fine tuning in post. I decided to try the expodisc a year ago and have not looked back. It has saved me so much time in post processing. Most of the time my color is spot on. The least used item is my lensbaby. Most of my clients are under the age of five and so are my own kiddos. I find it very challenging to use manual focus with subjects who are on the move. I am hoping that one of these days I can get out and shoot for just me and really start to play around with it more. 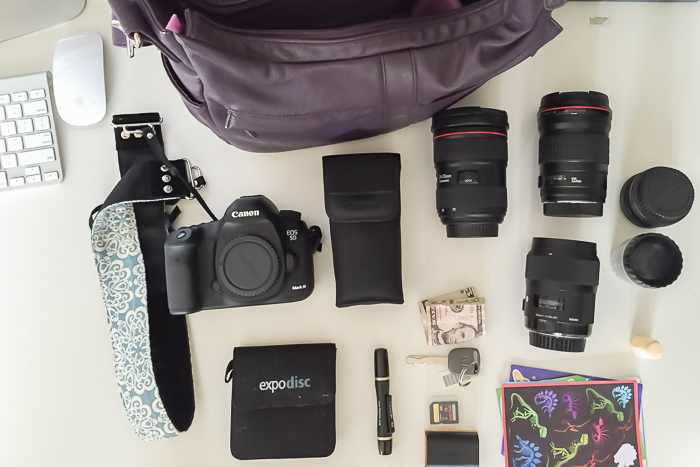 – EXTRAS: Memory card and battery, LensPen, spare car key and $5, stickers, small container of bubbles leftover from a wedding. 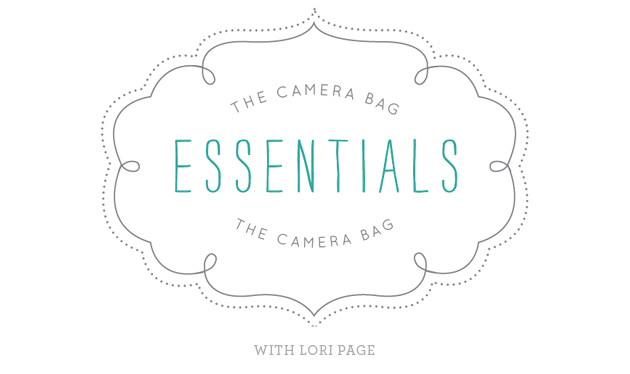 Thanks for giving us a peek into your camera bag, Lori! We especially love the stickers-as-place-markers idea (for photographers and parents)! For more from Lori, and for booking inquiries, please visit her website, Like Lori Page Photography on Facebook, and follow her on Instagram and Pinterest.